Unlike a traditional S.I. 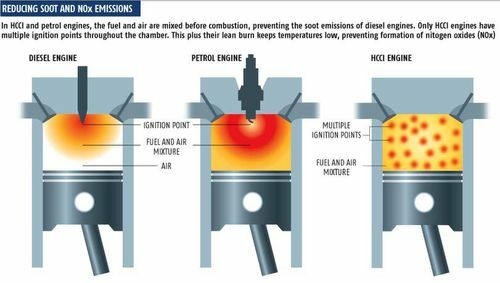 or Diesel engine, HCCI combustion takes place spontaneously and homogeneously without flame propagation. This eliminates heterogeneous air/fuel mixture regions. See Figure below from New Scientist magazine (January 2006). In addition, HCCI is a lean combustion process. These conditions translate to a lower local flame temperature which lower the amount of Nitric Oxide (NOx) produced in the process. NOx is a gas that is believed to be responsible for the creation of ozone (O3). For more info check out the Westbrook article.